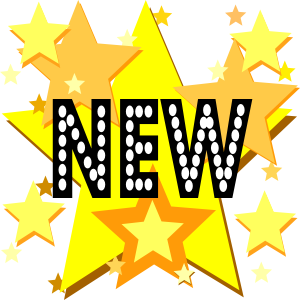 Now Building Up To 15" Gauge Equipment!!! Call for details. Center Cab with sloped hoods. We introduced this locomotive at this years Train Mountain Triennial. 2 bay steel hopper car! Click HERE to order RMI products! Live Steam Clubs, take a look at our new drop center bench car, perfect for your public run days! Which activity gives you the most enjoyment in the Live Steam hobby? Pulling the public on run days. miniature live steam railroad equipment in the world! RMI's product line and quality is unsurpassed in the industry with a complete line of live steam, steam outline, gas, diesel, propane and electric locomotives RMI has the largest selection in which to choose your motive power. 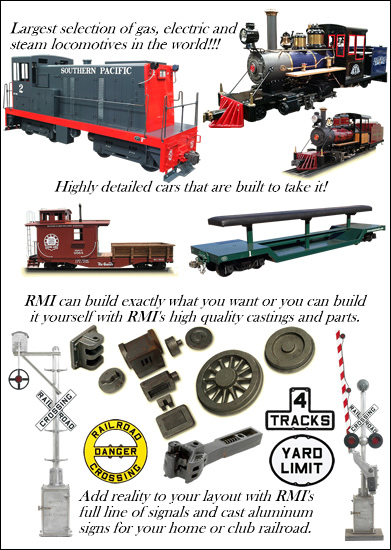 RMI also produces a full catalog of freight cars, industrial cars, trolleys and MOW cars, signals, rail and hardware to support your miniature live steam railroad. Whether you are a private railroad, live steam club, a shopping mall or park, RMI Railworks can provide you with exactly what you need to build your railroad and keep it running. The evolution of large-scale miniature railroading has in many ways paralleled the technological and sociological changes of our society. When early-day railroad enthusiasts set about building their "masterpiece", it was usually a locomotive that they had particularly admired, worked on, or even operated. Many of these builders were machinists by trade, or had some other strong grounding in one of the mechanical arts. The results of their efforts were often magnificent examples of inspired craftsmanship. While these stood as monuments to their creators, they often took five, ten or even more years to complete and rarely traveled far from their home track. Today’s hobbyist, while still an avid enthusiast, typically has far fewer hours to devote to craft type endeavors. Furthermore, for many, the emphasis is now on running rather than on building. Finally, since many rail fans now combine their interest in miniature railroading with other leisure time pursuits, such as RV'ing and visiting other club and friends’ railroads, many now desire easy to handle, instantly usable equipment. RMI's goal is to support and supply the traditional builder/operator, while offering a broad range of products to attract the next generation of enthusiasts. We have the broadest range of equipment ever available from a single supplier: ten electric and five gas-hydraulic locomotives, five trolleys, four models of 3 3/4" scale live steam locomotives (plans and castings or completed locomotives), plus riding cars, narrow gauge rolling stock, structures such as platform covers, signal bridges and towers, light towers, a complete modular track system, plus a full line of powered chassis, electronic controls, DC motors and gear boxes. While RMI products feature traditional construction techniques such as solid steel riveting and high quality castings, we also take full advantage of the most modern materials and manufacturing processes available. Thick section parts are cut with ultra-high pressure water jets, steel parts are laser cut, and machining is done on CNC machine and turning centers. As a result of this effort, all parts-original or replacement-fit and are affordable.